Organic mental disorders are behavioral or psychological disorders associated with transient or permanent brain dysfunction and include only those mental and behavioral disorders that are due to demonstrable cerebral disease or disorder either primary or secondary. Presence of confusion , disorientation ,memory impairment or soft neurological sign. Delirium is not a clinical entity but a symptom-complex of manifold etiology. Its presence signifies acute cerebral insufficiency and often represents a medical and/or psychiatric emergency.Though some forms of delirium have distinctive features, the fundamental phenomena are common to all, with clouding of consciousness the sine qua non. The condition has two major components: (1) the basic "acute brain syndrome" and (2) associated release phenomena.Clinicians must first make the vital differentiation between delirium and "functional" mental disorder, then proceed with the elucidation of the underlying diagnosis and the concurrent organization of symptomatic and etiologic treatment.Proper treatment combines management of the acute brain syndrome with general and specific procedures for control of the underlying condition. Dealing with the symptom-complex itself involves the principles and practice of sedation, hydration, and nutrition, nursing care and supportive measures. Provided the basic organic condition is treatable, the prognosis today is usually good. According to DSM IV TR delirium is characterized by a disturbance of consciousness and a change in cognition that develop rapidly over a period of time. In the English literature delirium was applied to an organic brain syndrome with impaired consciousness. In contrast, in France délire was originally used to describe a primary disturbance of perception. In 1909 Bonhoeffer defined delirium as a clinical pattern of acute brain failure. In the past it was known in different names such as acute confusional state, acute brain syndrome, acute organic reaction , toxic psychosis, metabolic encephalopathies . Delirium is a common problem in all health care settings, with a prevalence of 0.4% in general population, 1.1% in general population aged >55 years, 9–30% in general hospital admissions and 5–55% in elderly general hospital admissions. Possible causes of delirium, can be described with the well-known I WATCH DEATH mnemonic. 1. Delirium due to general medical condition : In this type the delirium is due to direct result of the physiological consequences of a general medical condition. Such conditions include systemic infections, metabolic disorders, fluid or electrolyte imbalances, hepatic or renal disease ,thiamine deficiency, post operative states, hypertensive encephalopathy, postictal states and sequelae of head trauma. 2. Substance induced delirium: this disorder is characterized by the symptoms of delirium that are attributed to medication side effects or exposure to a toxin. 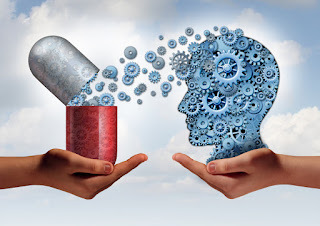 The following medications are reported to cause substance induced delirium : anesthetics, analgesics, antiasthamatic drugs ,anticonvulsants ,antihistamines, antihypertensive, antimicrobials, antiparkinsonian drugs immunosuppressive agents ,lithium ,muscle relaxants and psychotropic medications . 3. Substance induced delirium : Delirium may arise within minutes to hours after taking relatively high dose of certain drugs such as cannabis ,cocaine and hallucinogens . 4. Substance withdrawal delirium: it occurs after reduction or termination of sustained usually high dose use of certain substances such as alcohol, sedatives, hypnotics or anxiolytics. 5. Delirium due to multiple etiologies : It is associated with more than one cause. It may be the result of combined effect of general medication ad substance use. Impairment of consciousness is the key feature that separates delirium from most other psychiatric disorders. There is a continuum between mild impairment of consciousness and near unconsciousness. There is fluctuation in intensity, and symptoms are often worse at night. The patient may be unmistakably drowsy, but milder states are easy to miss, especially by those who are unfamiliar with the patient's normal intellectual performance. They may be apparent only in reduced or slowed performance on bedside cognitive testing. There is disorientation in time, place, and the identity of other people. Appearance and behaviour: the patient looks unwell and behaviour may be marked by agitation or hypoactivity, by a fluctuation between these states, or by a mixture of them—for example, a drowsy patient plucking aimlessly at the bedclothes. Mood is frequently labile, with perplexity, intermittent periods of anxiety or depression, or occasionally of other mood states such as elation and irritability. Usually, the mood states have an empty and transitory quality. Speech: the patient may mumble and be incoherent. Perception: visual perception is the modality most often affected. Illusions and misinterpretations are frequent. For example, a patient may become agitated and fearful, believing that a shadow in a dark room is actually an attacker. Visual hallucinations also occur. The small living creatures which may be seen in delirium tremens are the best-known example. Auditory and tactile hallucinations also occur. Complex sensory distortions, such as colours being experienced as tastes, would suggest intoxication with hallucinogens. Cognition: there are abnormalities in all areas of cognitive function. Memory registration, retention, and recall are all affected. Mild cases may show their most pronounced abnormalities in slow performance on tasks or in the wandering of attention away from the task at hand. Orientation: in obvious cases, orientation in person, time, and place will all be disturbed. Milder degrees of disorientation will need to be interpreted in the context of the individual patient. For example, it may be considered not abnormal for a person who has been seriously ill in hospital for a long time to be unaware of the day of the month. Concentration is impaired, for example, on tests such as ‘serial sevens' or ‘days of the week backwards'. Memory disturbances are seen, with impaired registration (e.g. digit span), short-term recall (e.g. name and address), and long-term recall (e.g. current news items). After recovery from the illness there is usually (but not always) amnesia for the illness. ICD 10 diagnostic criteria : According ICD 10 , for definite diagnosis of delirium ,symptoms should be present in each one of the following areas . Global disturbance of cognition ( perceptual distortions: illusions and hallucinations most often visual ; impairment of abstract thinking and comprehension with or with out transient delusions ,but typically with some degree of incoherence ,impairment of immediate recall and of recent memory but relatively intact remote memory ;disorientation for time as well as in more severe cases for place and person. Emotional disturbances .e.g. depression, anxiety or fear, irritability ,euphoria ,apathy. The onset is usually rapid and the course diurnally fluctuating and total duration of the condition much less than 6 months . Functional psychotic disorders can mimic the positive features of delirium, such as hallucinations. Stupor due to severe depression or mania can be mistaken for a diminished level of consciousness. Amnestic disorders, such as Korsakov's syndrome, also occur in clear consciousness, but the cognitive deficits are concentrated in short-term memory. Immediate recall (e.g. digit span) is normal in amnestic disorders, and long-term memory is relatively preserved: both are impaired in delirium. Sleep disorders (e.g. narcolepsy) and various forms of epilepsy (e.g. the rare petit mal status epilepticus in children) may also need to be excluded. A bedside mental status examination or Mini Mental Status Examination or neurological signs can be used to document the cognitive impairment and to provide a base line from which to measure the patients clinical course . Laboratory work up include CBP, electrolytes, thyroid function tests, ECG , EEG ,chest x ray ,blood ,urine , and CSF cultures . The management strategies include both nonpharmacologic and pharmacologic interventions. Initial interventions include general measures to support cerebral function, such as intravenous hydration and appropriate nourishment. Supplemental oxygen has been found to be highly effective in patients who develop delirium with pneumonia. Physical restraints, once a mainstay in the treatment of delirium, are now used only when all pharmacologic and nonpharmacologic interventions have failed. The hospital environment is a significant factor in the management of delirium. Environmental manipulations are directed toward providing the right amount of stimulation for the patient, encouraging sleep, maximizing the patient's ability to perceive the environment accurately, maintaining safety, and achieving familiarity and consistency for the patient. One of the most helpful interventions is having family members stay with the patient. Family members should also be encouraged to bring personal effects from home, because some patients with delirium are greatly comforted by the presence of familiar photographs or objects. Reorientation is one of the most easily accomplished cognitive interventions. The first step is to place a clock and a calendar where the patient can see them easily. The patient should then be verbally reoriented to time and place several times over the course of the day. Repetition is recommended to compensate for memory impairment in the delirious patient. The delusions expressed by a patient should not be directly disputed. Instead, alternative explanations of events should be offered, and frequent reassurance should be given. Symptomatic management: as many patients are agitated , emergency psychiatric treatments may be needed. Small doses of benzodiazepines (lorazepam or diazepam) or antipsychotics (haloperidol) may be given orally or parenterally. Resolution of symptoms may take longer in patients with poor pre morbid cognitive function, incorrect or incomplete diagnosis of contributing factors, and structural brain diseases treated with large doses of psychoactive medications prior to the onset of acute medical illness. For some patients, the cognitive effects of delirium may resolve slowly or not at all. Educating families and patients regarding the etiology and course of disease is an important role for physicians. Educate the patient, family, and primary caregivers about future risk factors. Families may worry that the patient has brain damage or a permanent psychiatric illness. Providing reassurance that delirium often is temporary and is the result of a medical condition may be beneficial to both patients and their families. Suggest that family members or friends visit the patient, usually one at a time, and provide a calm and structured environment. Encourage them to furnish some familiar objects, such as photos or a favorite blanket, to help reorient the patient and make the patient feel more secure. Client history : from the clients history ,nurses should assess the following areas of concern. Delirium or acute confusional state is a transient global disorder of cognition. The condition is a medical emergency associated with increased morbidity and mortality rates. Early diagnosis and resolution of symptoms are correlated with the most favorable outcomes. Therefore, it must be treated as a medical emergency. Henry WD, Mann AM. 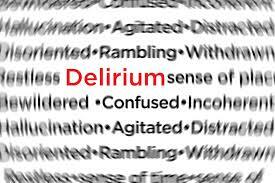 Diagnosis and treatment of delirium.. Can Med Assoc J. 1965 Nov 27;93(22):1156-66. Fortinash K M, Worret P H. Psychiatric Nursing Care Plans.5th ed. Philadelphia: Mosby Publications; 2007. The ICD 10 Classification of Mental and Behavioral Disorders .World Health Organization.Geneva.1992.